Police say at least 14 people have been killed in a mass shooting at a southern California social services center with at least 17 others wounded. 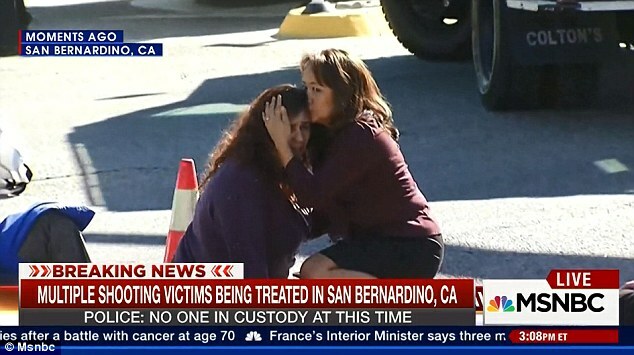 Police said as many as three shooters entered the Inland Regional Center in the city of San Bernardino, east of Los Angeles, and opened fire on people at about 11 a.m. local time on December 2. The shooters were reported to be heavily armed while wearing military attire and possibly body armor. The gunmen left the scene in an SUV and were pursued by police. Security forces later killed two suspects, one male and one female, in a shootout. 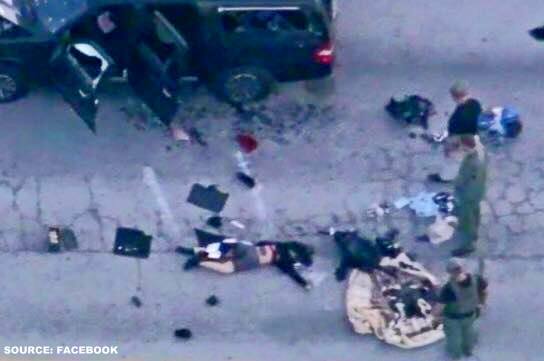 One suspect was seen on television lying lifelessly next to a black SUV riddled with bullet holes. The brother-in-law of one of the suspects says he was stunned to hear of his relative's involvement in the shooting. Authorities found what they believe is an explosive device at the scene of the killings. Bomb squads were working on it. Police continued to pursue a possible third suspect, going door to door through residential neighborhoods and searching a home in Redlands, California. One individual seen running from the scene of the police shootout with the suspects was detained for questioning. Police said they did not know the motive for the latest in a spate of mass shootings in the United States. The FBI joined the investigation and had not ruled out that it was an incident of international or domestic terrorism. "They came prepared to do what they did, as if they were on a mission," San Bernardino Police Chief Jarrod Burguan said, noting the shooters carried long guns, not handguns. The facility that was attacked worked with people who had disabilities and had hundreds of employees and patients within it at the time of the attack. Most of the people killed were health-care workers attending a banquet at a conference center in the Inland Regional Center building that was more open to the public and had less security. Triage units were set up outside the building to treat the injured. Other people who escaped the building were taken by bus to safe places. San Bernardino, a city of some 214,000 people, is about 100 kilometers east of Los Angeles. U.S. President Barack Obama criticized what he said was a "pattern" of mass shootings and reiterated his call for Congress to pass tougher gun control laws. "The one thing we do know is that we have a pattern now of mass shootings in this country that has no parallel anywhere else in the world," Obama said.